Sea to Summit Ultralight Insulated Mat. The Ultralight sleeping mat range has a single layer of medium resolution Air Sprung Cells™ to give you the lightest and smallest packed-volume mat without compromising comfort. To add warmth, Sea to Summit uses Exkin® Platinum, a quiet non-woven fabric that reflects radiant heat back to the user and Thermolite®; insulation to prevent convective heat loss between your body and the ground. All Sea to Summit air sleeping mats come with a repair kit containing six self adhesive patches for repairing punctures in the field, a spare silicone one-way valve insert and now an Airstream Pumpsack. Exkin Platinum® fabric and Thermolite®; insulation are combined to prevent radiant and convective heat loss. The Ultralight range features a single layer of Air-Sprung Cells™; for lightweight stability and comfort. 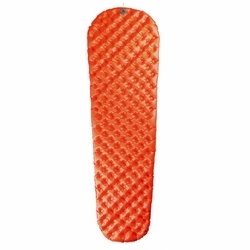 The Ultralight Insulated Mat has an R-Value of 3.3 and is ideal for three season use.